Questions of security and data protection are the main discussion points in the Smart Home sector. As the key protection element of your home, the front door is particular in the spotlight when it comes to security questions. From Nuki’s beginning, the topic of security and data protection is deeply rooted in our values and company philosophy. We invest a lot of time and attention to these areas with every update and iteration we make. Now, these core principles have been thoroughly scrutinized by the independent German IT security institute AV-TEST, resulting in the Nuki Combo being considered the safest Smart Lock in the test. The aspects for evaluation were the local communication (in the case of Nuki it is an end-to-end encrypted Bluetooth connection), the security concept for controlling the Smart Lock via the internet, the security of the app in general and the level of data protection. The Nuki Smart Lock was the only Smart Lock with a maximum rating in this international comparison. Not only did the security aspects of Nuki come to the fore during the course of the test, but the simple installation and the high level of data security were also praised. Regarding the data security, the testers analyzed the data privacy statements of all suppliers in detail. In addition to the encrypted locking commands, the software update behavior was also examined. 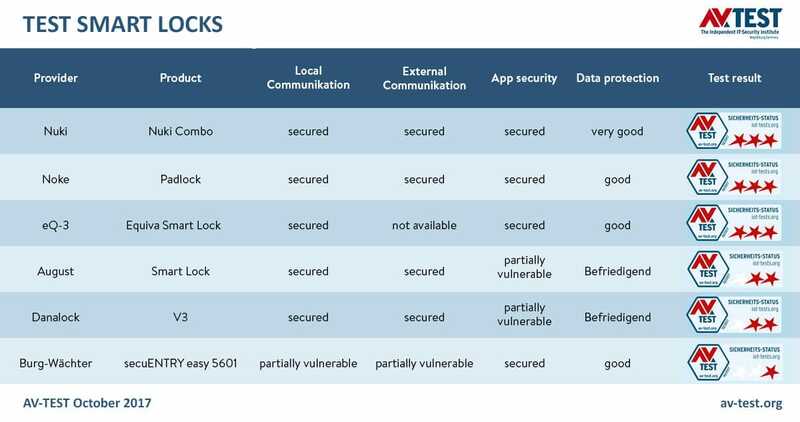 Since Nuki uses a completely encrypted connection to retrieve the software updates (and a physical action at the lock is required to initiates the update), the highest security standards were also awarded in this respect. The log files of all Smart Locks in the test were also checked to determine whether the data from the log files allowed user information contained to manipulate the Smart Lock. Nuki never creates or stores a log file so there are no vulnerabilities to exploit. Note: the log file must not be confused with the protocol. The locking protocol is stored locally on the Smart Lock. The locking protocol also does not contain any security-relevant data, but – if activated – only records when a user has operated the Smart Lock. The Nuki Combo emerged as the unanimous best Smart Lock in the test. The result is very pleasing for all of us at Nuki, but we will continue to give our best so that your Nuki Smart Lock remains permanently secure whenever and where ever you need it.